This challenge was suggested by my lovely friend Gill. I met Gill back in 2008 when I first visited Manchester to see Dave during our first summer away from University. Gill went out of her way to make sure I felt welcome in Manchester and has since become one my closet friends. Working shifts as a nurse means we don’t get to see each other as often as I’d like but we always have a great time when we do manage to get together. Unfortunately, I didn’t even manage to get a date to make this challenge when Gill was free to come and try some of the result 😦 I have therefore promised to make this panna cotta again in the future and hopefully we’ll manage to get a date in the diary soon! I spent a bit of time looking for recipes but eventually settled on the first one I’d look at by Simon Rimmer. I didn’t immediately decide to use this recipe only because I don’t really like raspberries. In fact, most of the recipes I found used raspberries! 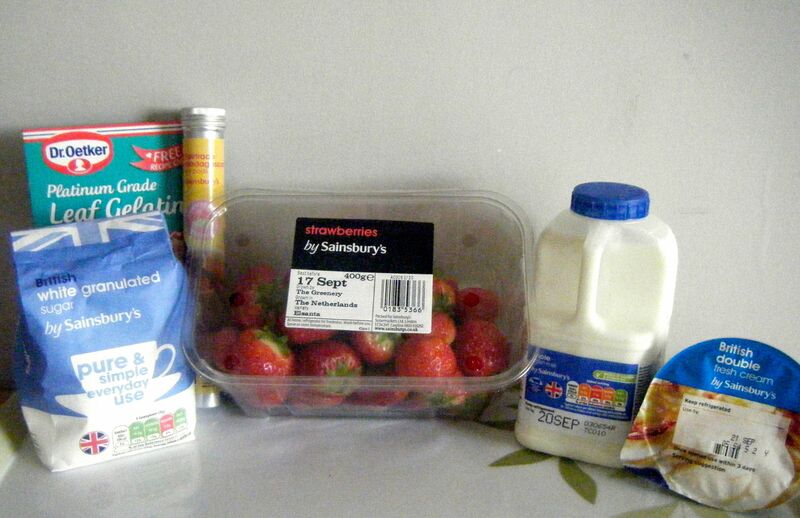 Eventually, I decided I would just adapt Simon’s recipes to make a strawberry coulis instead. I began this recipe by separating my gelatine leaves and popping them into some cold water. The recipes says to soak them until they are soft – I had no idea how long this would be! But the back of the pack suggested soaking them for 5 minutes so I used this as a guide. 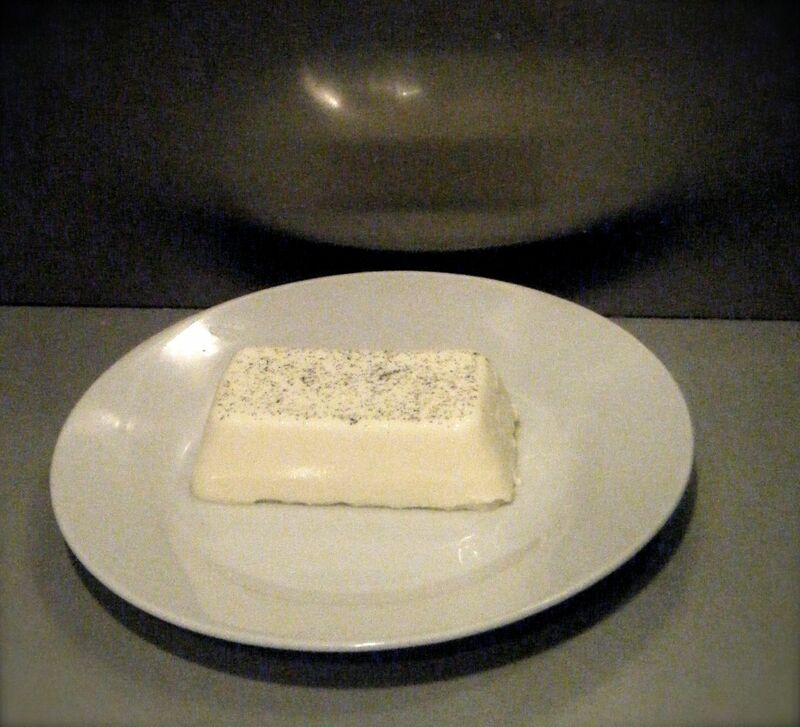 Whilst the gelatine leaves were soaking, I put the milk, cream, sugar, vanilla pod and seeds into a pan over a medium to low heat. I kept stirring the mixture regularly until it came up to a simmer and then took it off the heat before removing the vanilla pod. I then squeezed the water out of the gelatine leaves and added them to the vanilla mixture. I gave it a good stir until it looked like the gelatine had fully dissolved. 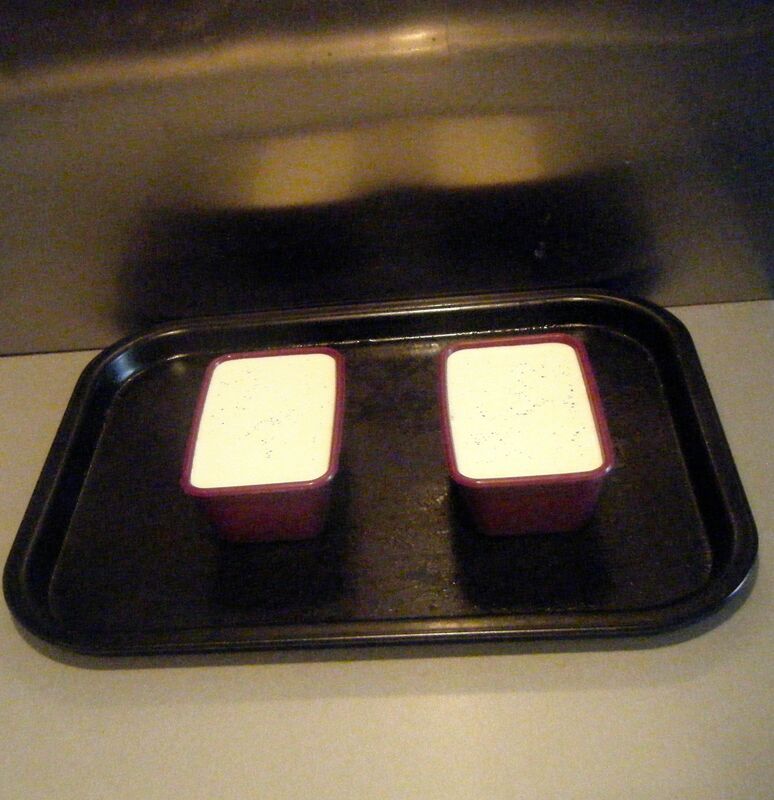 The recipe then says to divide the mixture between ramekins. However, in my search for a recipe, I read a tip that said to get a really smooth panna cotta, try pushing it through a sieve first. So I thought I would give this a go and poured the mixture through a sieve into a pouring jug. I popped the filled loaf tins into the fridge. The recipe says to leave them for at least an hour. I actually made these in the middle of the afternoon and turned the first one out at about 9pm so they had plenty of time to set. Once I’d had diner and was ready for dessert, I got started on the fruit coulis. I put the sugar and water into a pan over a medium heat. Whilst this was coming up to boil, I cut the tops off my strawberries and chopped them in half. 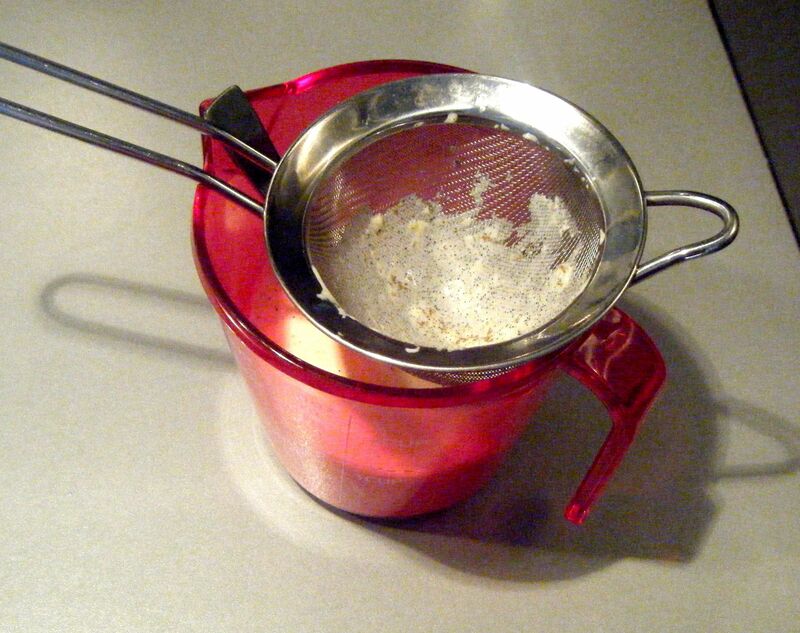 When the sugar had dissolved, I took the pan off the heat and added the strawberries. I then used a hand blender to blitz it together. 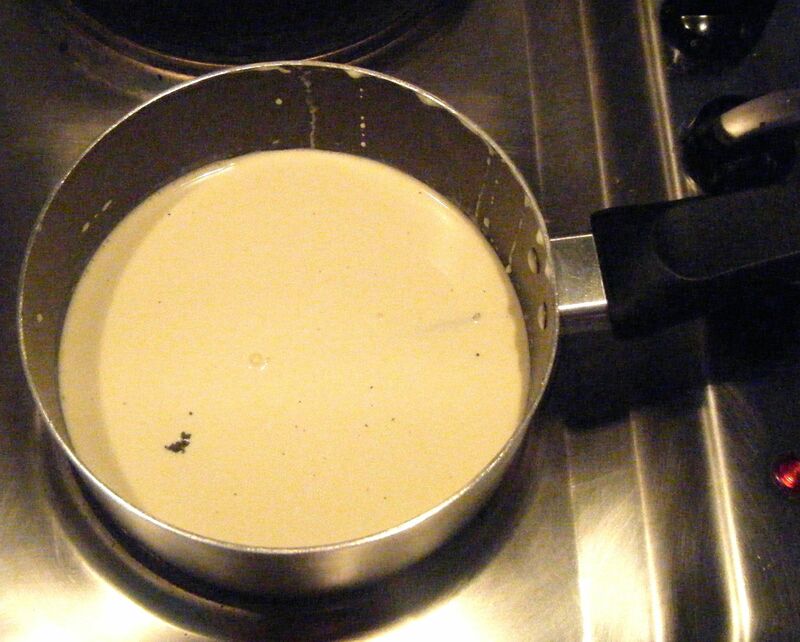 Actually, I couldn’t do this in my pan as there wasn’t enough depth to the liquid to stop it splashing everywhere! So I poured the mixture into a jug and gave it a blitz. The sauce was meant to thicken up but it was still really watery. I therefore decided to pop it back over a low heat for around 5 minutes. This seemed to do the trick. 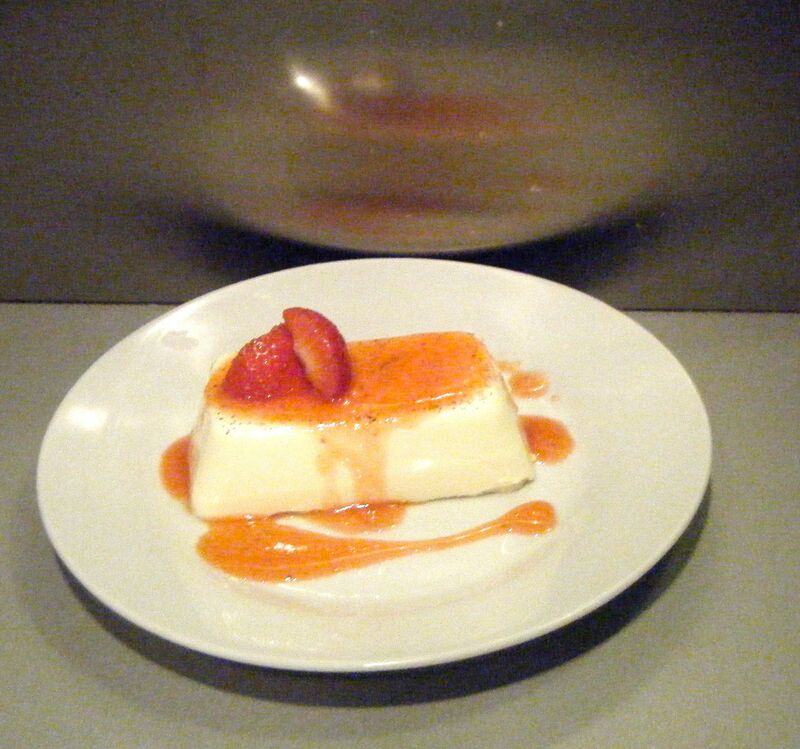 I left the sauce to cool down and then turned out the panna cotta onto a plate. 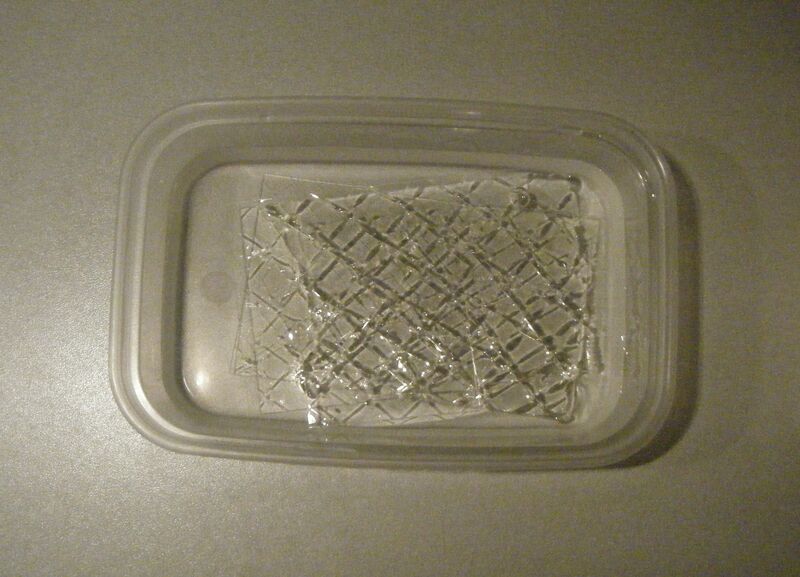 Practical tip: dip the mould into hot water to release it slightly. I drizzled over some of the strawberry coulis and added a chopped strawberry to the top. This was really tasty. It was so creamy and the strawberry sauce, whilst not very red, was delicious! Dave tried ONE mouthful and then said he didn’t want any more. He’d gorged all day on sweets and crisps so I think (and hope) it wasn’t a reflection on the end product. Anyway, I decided to leave the second panna cotta in the mould until the following night when I got to enjoy it for dessert again! And it was just as good having been left in the fridge for 24 hours. I was actually really surprised at how easy this was to make and I love the fact it can be made so far in advance. Coming up next week, Challenge No. 38 – beef bourguignon. This entry was posted in Challenge 52 and tagged Challenge52, Cream, dessert, Fruit, vanilla by MyGastroAdventure. Bookmark the permalink.